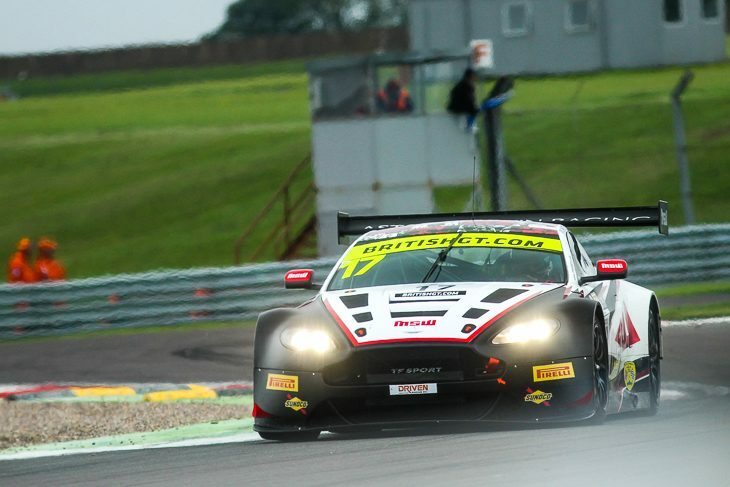 Marco Sorensen put the #17 TF Sport Aston Martin he shares with the retiring Derek Johnston fastest in Saturday morning’s first free-practice session at a cold and cloudy Donington Park. The Dane went round in 1:27.771 with eight minutes of the session remaining, eclipsing the efforts of his fellow Aston factory drivers Johnny Adam (1:27.858 in the Optimum car) and Nicki Thiim (1:27.997 in the sister TF Sport machine). Phil Keen’s 1:28.004 in the #33 Barwell Lamborghini and Yelmer Buurman’s 1:28.030 in the #116 ERC Sport Mercedes were good enough for fourth and fifth fastest respectively, while Darren Turner put the Beechdean Aston sixth on the timing sheet with a 1:28.266. In GT4, there was extensive shuffling of the order in the early part of the hour, eventually settling down with Scott Malvern in P1 courtesy of a 1:35.908 in the Team Parker Racing Mercedes. Second and third in the class at the end of the session were Finlay Hutchison (a 1:36.017 in the #10 Equipe Verschuur McLaren) and Dean Macdonald (a 1:36.137 in the #43 Century Motorsport BMW). No red flags interrupted the session, which ran to the full 60 minutes without significant incidents.